Even if you make the effort to recycle contact lenses and packaging in standard recycling bins, they can get filtered out due to their small size - contributing to landfill waste. Each day, place your used blister packs, top foil, and contact lenses into a small container. Once your container is full or you want to drop off, simply bring your recyclables to our office and place in the contact lens recycle bin in our reception area. All brands of contact lenses and blister/foil packs. Please do not include any cardboard packaging boxes when dropping off at our office as these are recyclable through your regular municipal recycling service. Do I need to clean the waste before I send it in? No, you do not need to clean the waste before dropping it off at our office. 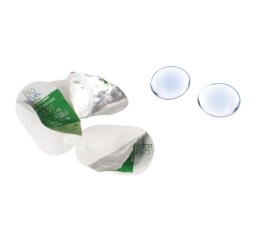 Once received, we ship to the contact lenses to a TerraCycle facility where the contact lenses and blister packs are separated by composition and cleaned. The metal layers of the blister packs are recycled separately, while the contact lenses and plastic blister pack components are melted into plastic that can be remolded to make recycled products. 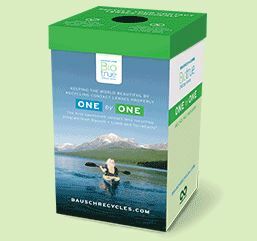 As a thank you for your dedication to Eliminating the Idea of Waste, for every qualifying shipment of 2 pounds or more, a $1/lb donation will be made to Optometry Giving Sight. Optometry Giving Sight is a nonprofit working to prevent blindness and impaired vision for those who do not have access to eye exams and glasses/contacts.